Michael wrote: I don't let Kili on my shoulder for the most part unless I put her there. From time to time she'll land there and then start getting bossy and nip my ear for attention. So instead I use shoulder time strictly as a reward and only for the duration of good behavior. Often I use the chance to go on my shoulder as a non-food reward for flight recall. If she lands on my shoulder without being called I shake my shoulder and shout "OFF." As for my own sennie, Tiki has shown GREAT improvement in her behavior. Getting enough sleep, letting her wings grow out, not using my phone around her (lol), and using positive reinforcement has been key. The aggression has greatly decreased; she's been a total sweetheart. I think the "only" issue I have with Tiki currently is that she wants to cuddle with me 24/7. She always wants to be on my shoulder, kissed, and coddled. She is more affectionate than a dog! She flies at me, waddles to find me when I'm in another room, and calls for me when I leave the room. I want her to be more independent. Toys do help but they only capture her interest for so long, as she tires of them and gets bored. Wow - this is my first day on this site and I'm so happy to find posting about senegals. Hector (whom we assume is a male - bright orange belly - beautiful green body) is my favorite - he has always been friendly, a shoulder bird from getgo - likes to look into your eyes and rub his beak along your cheek & nose. Neither my husband or I have had bad bites from him - we know he is serious or warning us by him giving a finger a strong holding onto. Polly came with Hector - she is a slight bird and 40% of the time very angry/aggressive. they came in one cage but she started being so mean to Hector we seperated them about 8 years ago. We think Polly's female, she is kind to my husband, she puts up with me. some of the comments each of you made above amaze me at how many similarities our birds have. I allowed Polly on my shouldler when we first got her, but she attacked my ear and well we've all just thought it best not to shoulder her any longer. Then this summer she jumped on my shoulder, I thought Oh - hmmm ok I had a tank on - lotz of bare skin showing. Nails were sharp but non-untolerable, then I felt a burning peircing pain, I went to my husband - bent down and asked him to take her off my shoulder/back area. For some reason she noiselessly took a 1/4" chunk out of my lower neck. ouch. no more shoulder rides from me. We do better when she's sitting on something besides me. Aggressive towards each other - we do keep them apart, when we are not home they do stay in their cages, when we are home we do not leave them alone because they end up on each other's cages and toes get bitten, they just go at each other. I just think for little birds they are GIANTs of personalities. but I thank you for your comments back and forth to each other - what wealths of knowledge. It seems to me that you need to go back to basics with your girl. Start with target training and work your way up from there. I know they can 'Hyde' on you at any time, but rewarding her for good behaviour will help to make her forget the bad. Hi thanks for the reply - what is bantersnatch? I am not familiar with Target training? HA! I just got the reference to "Hyde" yes you are right. What do you give them for rewards? If you can take a bite on the neck then carry her to your husband to take off - you are a true parrot parent. Sometimes it takes a lot of nerve. Not showing fear teaches her that she gets no where with it. Hi all. I'm brand new to owning a parrot, though I did work for a vet that treated both wild & tame birds for 7 yrs. My fiance, Toby, & I adopted an African Senegal from Craigslist about 2 days ago. He enjoys being scritched on his own terms (will lower his head to signal it's ok) but seems to also enjoy biting me quite frequently. He obviously likes Toby better than me as he's only nipped him once. 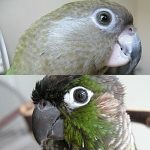 My question about biting is the fact that Cracker (the parrot) will do a kind of fake out, then bite. For example, about 5 mins ago, I walked slowly up to his cage talking to him with my hand held like a perch, saying "step up." He didn't show that he was going to bite me immediately (opens his mouth wide & goes for me), but as soon as he put a foot on my hand, he bit me! He bites hard enough that it hurts quite a bit, but not enough to break the skin so far. I've found that if I'm trying to get him to step up and he wants to bite, that if I put my other hand behind him & "herd" him towards the hand to step up, he won't bite. Thoughts? socal_sarah wrote: My fiance, Toby, & I adopted an African Senegal from Craigslist about 2 days ago. 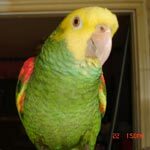 ... My question about biting is the fact that Cracker (the parrot) will do a kind of fake out, then bite. For example, about 5 mins ago, I walked slowly up to his cage talking to him with my hand held like a perch, saying "step up." He didn't show that he was going to bite me immediately (opens his mouth wide & goes for me), but as soon as he put a foot on my hand, he bit me! ... I've found that if I'm trying to get him to step up and he wants to bite, that if I put my other hand behind him & "herd" him towards the hand to step up, he won't bite. Thoughts? Congratulations in your Senegal. How old is he? First of all you want to try to avoid being bitten. It's really easy to accidentally reinforce a bite so you need to try as hard as you can to avoid the bite in the first place because when biting is reinforced the bird will very quickly learn to bite to get what it wants and it's very hard to "un-teach" learned biting. You said he showed no signs before he delivered a bite and while this is possible it's more likely he did show some signs that were overlooked. Look for eye pinning, raised feathers around the beak or on the nape of the neck, or any other body language that indicates aggression and if you see it, back off. Alternately look for positive signs indicating he wants to step-up such as lifting a foot as you approach him. If he is literally not showing any sign of biting or aggression but bites when he steps up that means that "step-up" was forced on him in the past and he learned over time to suppress all signs of aggression in regards to "step-up" and that is kind of a scary situation. Sometimes a Poi will just sit perfectly still like a statue just waiting to bite as soon as the hand is in range but this is a learned behavior. A common misconception for a new bird owner is that a bird MUST OBEY the step-up command AT ALL TIMES and that makes it into a dominance thing and birds do not respond well to dominance (meaning they respond with aggression). Don't "herd" him because this further enforces the idea that step-up is about dominance. He needs to have a choice and the right to say "no." If he doesn't want to step-up there is no reason to force him to do so unless it's some kind of emergency and you have to evacuate your house or something. Leave him alone for a few minutes and try again. A bird is not like a dog which independently seeks out interaction with people and you need to use a different approach. The best thing you can do is use positive reinforcement to show him that good things happen when he steps up. If he knows he is going to get a reward for stepping up and/or that good and fun things happen after he steps up he will rarely if ever refuse to step-up or bite. If you are not familiar with using positive reinforcement to teach a behavior see Michael's Taming and Training Guide. Andromeda brings up some great points. I wanted to share that my parrot does a pretty terrible job of showing me when she's going to bite too. She too has in the past stepped up happily and then wham a bite. I discovered that with other people Nika was getting upset because she wasn't getting what she wanted. In two of the biting cases she was mad that she was being set back down on her perch or in her cage again as she wanted to stay out with people. With me I found in some of the instances there may have been fear that I was not providing a "firm" place to perch on my finger. She didn't trust that I wasn't going to drop her on the ground. These are just assumptions but I became extremely careful about providing a "firm" place for her to perch and not showing any doubt. She's also just a little bit of a punk, but I love her. I've never gotten bit if she knows something good is going on. Although sometimes I had to make her realize something good was going on. By this I mean she never bit me when coming out of the cage. I showed her that I will only have her step up out of the cage if she's right at the front perch waiting for me. Therefore, she has some control and feels safe, so there's no need to bite me. Also I made out of cage time fun by doing tricks for treats. Initially it was just targeting around but now we do more. I also made going back in fun too, because like I said she could get a little cranky. So I'd trick her and use the target stick to target someplace off my hand for a treat when going back into the cage. Therefore, she was distracted and would hop off my hand happily. Thanks for the quick responses! Cracker is 18 yrs old. I didn't notice any of the signs listed before the bite, though I don't know what "eye pinning" is. I did, however, notice that immediately afterwards, he puffed up. I haven't started the touch training yet as I'm still trying to figure out what exactly he even will take from my hand. So far, it's only been pieces of butter cracker & peanut in the shell. His other owner said that he liked to eat apple pieces, peanuts & his seed mix. So far he won't try anything new. Yesterday & today, I put fresh fruit & veggies (spinach, honeydew melon, tomato, purple grapes, celery and pear) that he hasn't really messed with. I did, however, find a piece of yesterday's tomato nibbled into bits on the ground. Considering what was there, I doubt he ate any.